Love a good genuine sale! We only do 'real' sales as I hate nothing more when you get notices for sales and all they have is reaaaallly old stock and nothing else. 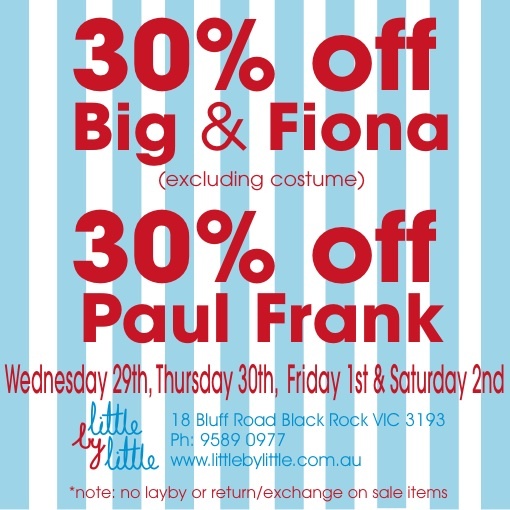 At Little by Little when we do a sale it is current and across the board! 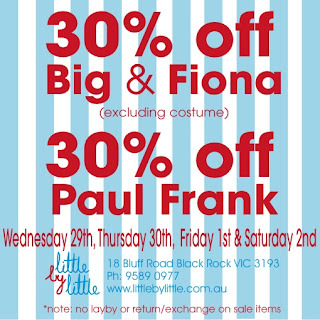 Wednesday, Thursday, Friday and Saturday we will have Paul Frank, Big and Fiona all reduced by 30%. Got to love that! The promo code for online orders is BPF01 but if unsure please ring the store on 0395890977. On another note, now that daylight savings is starting, thats another thing on my fave list of things, Sunday trading is back at Little by Little! We will start on Sunday 3rd October right through to Christmas (scary we are talking about Christmas! Agh!). The hours are 11.00am to 4.00pm. Hope to see you!